Cherry Plum (Prunus cerasifera) in bud. Trowbridge, 27th February 2011. Prunus cerasifera (Cherry Plum), a haze of thousands of green-creamy buds. (Click photo to see it better.) This is the earliest semi-wild Prunus to make a showing, and these trees are earlier than any of the others in my area, probably because they're growing in a sheltered spot over water (the River Biss). Within the crown a few blossoms had already decided to go for it. Some of these early ones have six petals, like the one on the right (below). 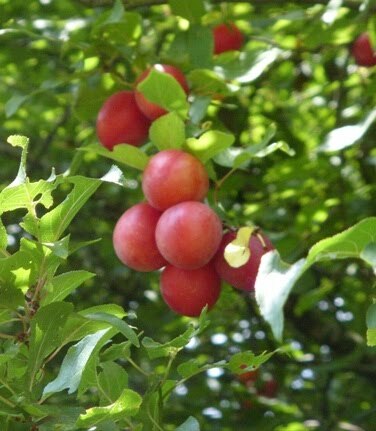 Cherry Plum is also known as Myrobalan Plum. Being particularly incurious I had never wondered before what "Myrobalan" actually meant. I just assumed there was probably some part of the world called Myrobal or Myrobalia where this plant originated. Not so. The tree is native to large areas of Europe and Asia (though not the UK), and the general etymology of "myrobalan", according to something I read on the web, is : "Obsolete French mirobolan, from Latin myrobalanum, fragrant oil from seeds of the horseradish tree (), from Greek murobalanos : muron, perfume + balanos, acorn." Eh? Well, as far as I can make out the name became attached to a number of small tree species (e.g. 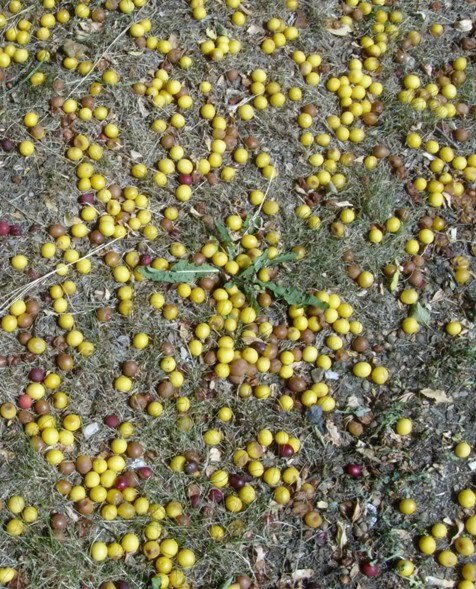 the tropical fruit tree Phyllanthus emblica, commonly known as Myrobalan) and then ended up becoming applied to the cherry plum, referring to the smallish globular fruits. Or did the transfer go in the other direction? 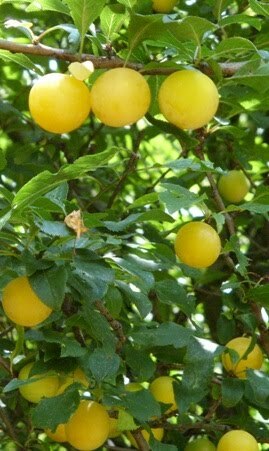 To add to the confusion, the word was inevitably conflated, in many people's minds, with "mirabelle" (a cultivated variety of plum, grown in France). This history of promiscuous redeployment of the same name is fairly standard for non-scientific plant names (and scientific ones too, if you give them half a chance). 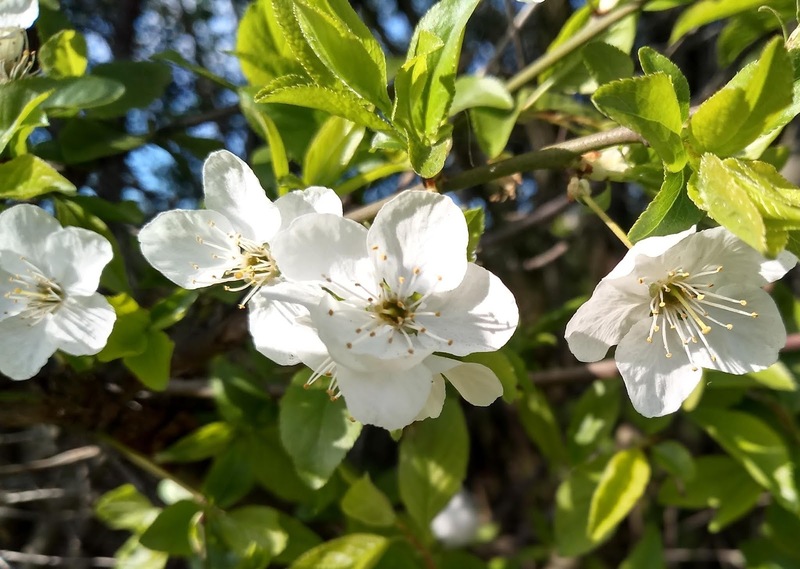 Cherry Plum (Prunus cerasifera), first blossoms. Trowbridge, 27th February 2011. Mid-March 2011, now smothered in blossom. A very common tree along the busy roads here. 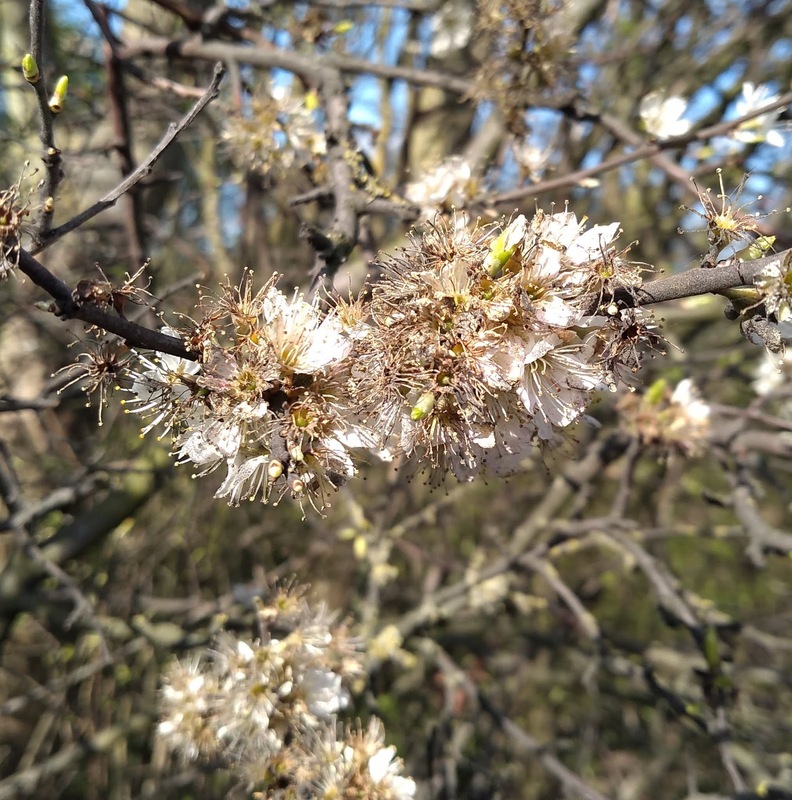 By this time, in any normal year*, P. cerasifera is starting to overlap with early-flowering Blackthorn (P. spinosa). [*In 2013 it was different. Cherry Plum was off and running by the end of February, as usual, but then it ran smack into the coldest March in half a century; a sustained spell of arctic high pressure with day after day of freezing temperatures. 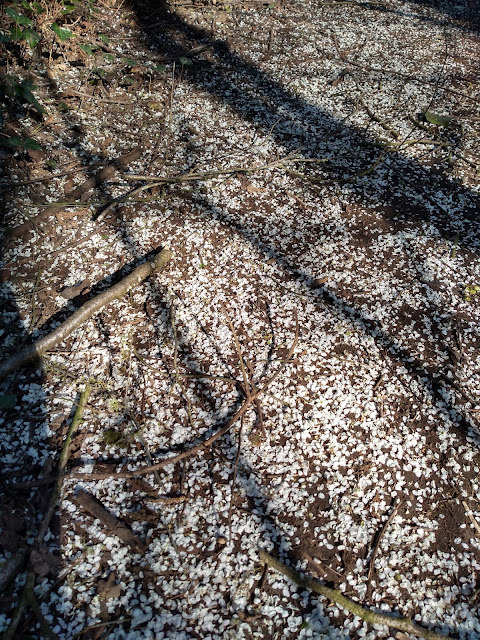 All the other blossom-trees slammed on the brakes, but Cherry Plum was already committed. So it had March all to itself, standing there miserable and cold, crying out to non-existent insects, and at last reluctantly fading. 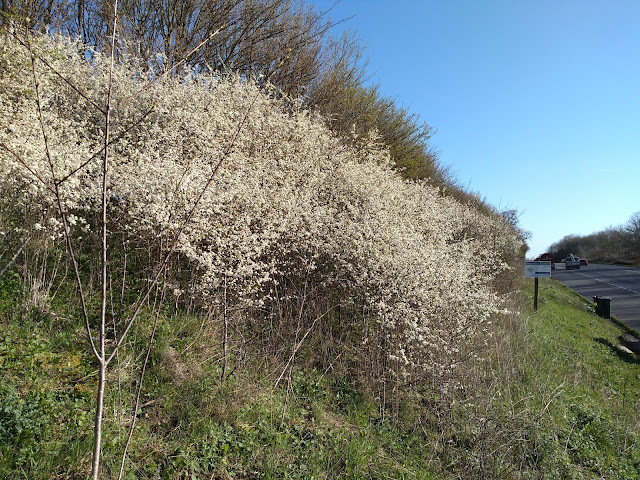 The weather finally broke around 6th April; I saw Blackthorn coming into flower on the 9th. By then, some of the Cherry Plum (including the earliest flowerers) had long since shot their bolt. The rest, however, made remarkable efforts to prolong their flowering season and thus salvage something from the year. They looked strangely impressive in a battle-scarred way; most of the crown was a mass of brown withered blossoms but lines of new blossom crept over the surface, mostly low down and near the tips of the shoots. Cherry-plum (Prunus cerasifera), late blossom. Swindon, 26th March 2019. P. cerasifera blooms several weeks earlier than P. spinosa. P. cerasifera blossom is accompanied by the opening leaves; P. spinosa blossom appears before the leaves. P. cerasifera flower-stalk is as long as petals, P. spinosa flower-stalk is shorter than petals. One upshot is that P. spinosa blossom tends to bunch, with the flowers pointing out in different directions. P. cerasifera sepals are more likely to reflex. P. cerasifera twigs are at a more acute angle to the parent stem (P. spinosa twigs are almost at right-angles). Blackthorn (Prunus spinosa). Frome bypass, 25th March 2019. Blackthorn (Prunus spinosa). A typical roadside thicket. Frome bypass, 25th March 2019. From a Facebook discussion about the once more common practice of keeping railway embankments clear by burning: "Black thorn doesn't burn unless the fire's been started with less dense wood, in which case it burns hot enough to forge with!" 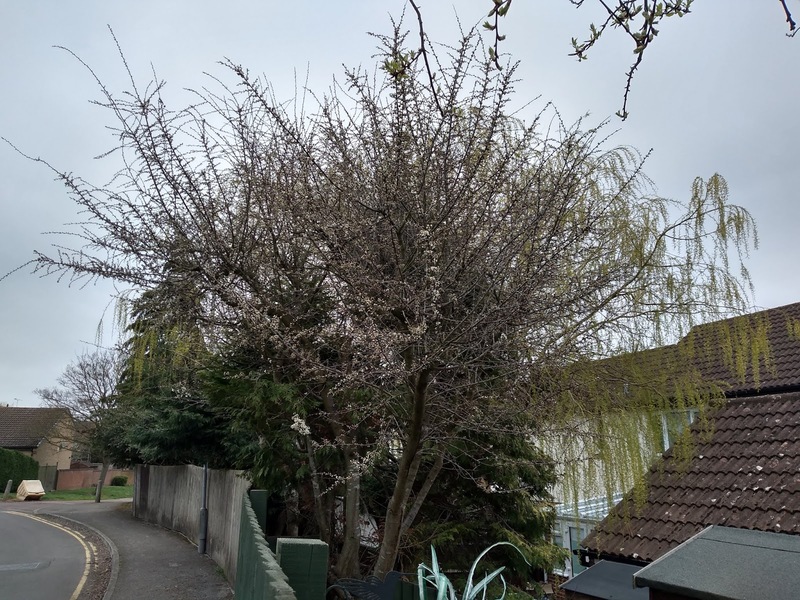 Blackthorn (Prunus spinosa) as a garden tree! Swindon, 21st March 2019. Blackthorn (Prunus spinosa), fading blossom. Swindon, 26th March 2019. (Above and below.) Now here's a puzzling one. This Swindon individual has numerous fierce thorns, and the flowers appear before the leaves. So far, that sounds like it should be Blackthorn. But it blooms at the same time as Cherry Plum, and has relatively big flowers with long flower-stalks. I reckon it's most likely a deviant Cherry Plum, though it could be a hybrid between the two. 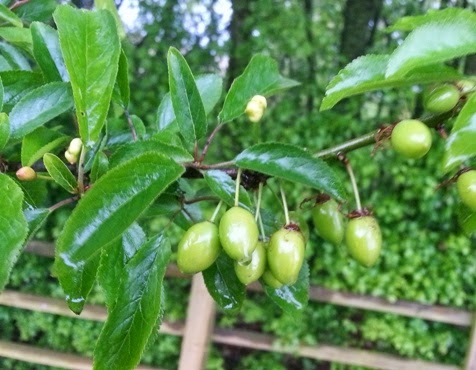 Cherry Plum (Prunus cerasifera), young fruits developing. Swindon, 20th April 2014. 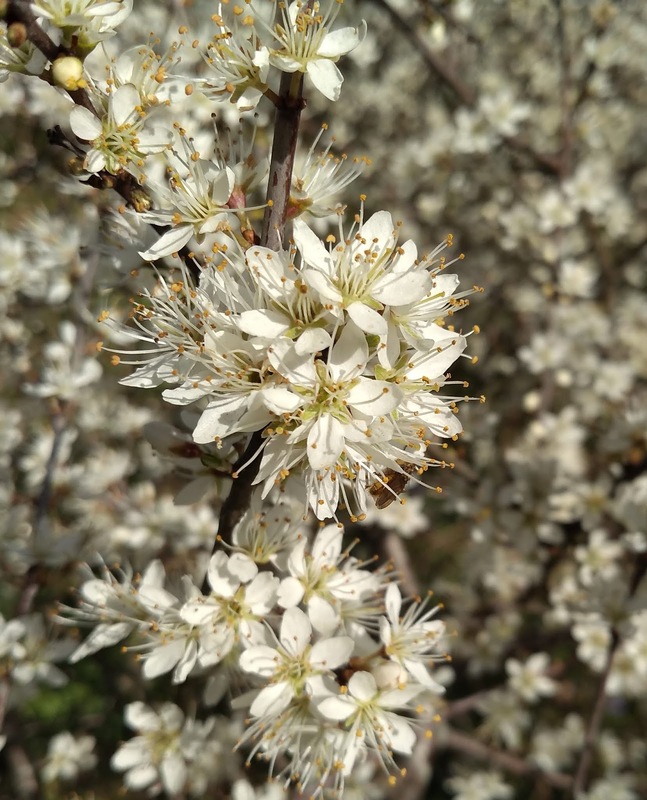 Cherry Plum blossom may be very uniform, but the fruit is surprisingly varied in size, shape, colour and flavour. It isn't as sweet as a Victoria but it's still very nice. This is an abundant wild food around towns, for those who care about it. The pictures below were taken in August. 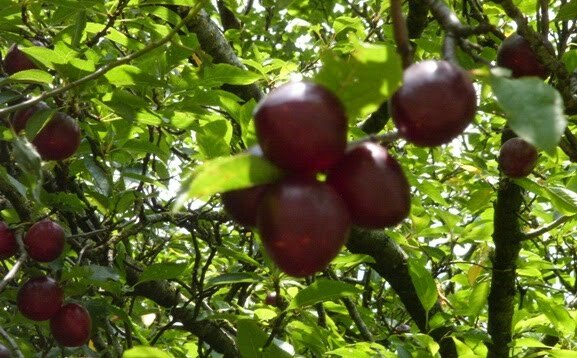 Cherry Plum (Prunus cerasifera), ripe fruit. 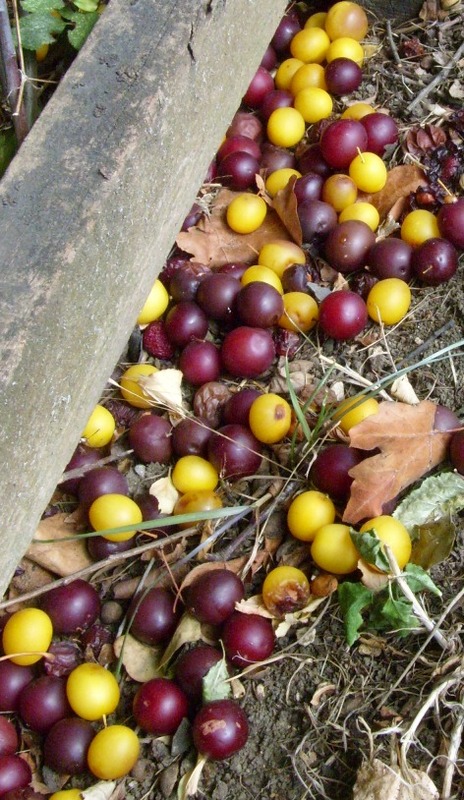 Cherry Plum (Prunus cerasifera), fallen fruit. Hello world! This is an english translation of my spanish poetry book. A poem every day.